Here is such a smart idea! 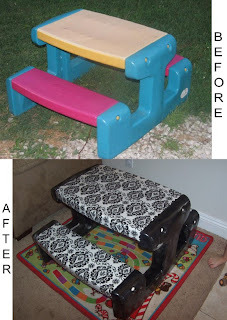 Keep your eyes open at yard sales, or even in the garbage, for a kid's plastic picnic table. Basically, Caroline of Caroline's Craft Corner just spray-painted her table and used a staple gun to attach fabric, and then vinyl on top. Check out Caroline's post for instructions, and tons of pictures of other tables who tried out this project! Check Amazon for more kids' picnic table ideas!